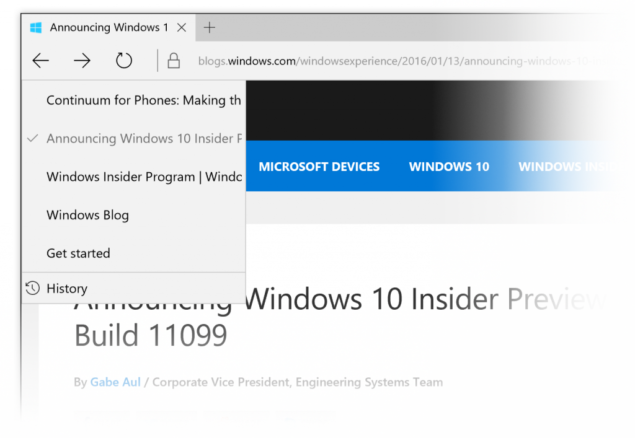 Microsoft released Windows 10 PC Preview build 11102 last night, bringing in a new feature for Microsoft Edge and a bunch of known issues. Some of the testers were annoyed by the fact they received more new bugs than the new features and took over to Twitter to complain to Gabe Aul. Gabe has shared that a surprising number of 1200 changes have been made between the new build and the build 11099 of the last week. The increment between Insider Preview build 11099 and 11102 seems pretty small but it has managed to bring in 1200 changes in the operating system. The new build brought in only one new “visible” feature, the ability to right-click on the back and forward buttons in the Edge browser. While this feature has been present in other browsers for several years, the feature was one of the top requested for Microsoft’s Edge. @AliNsoor Over 1200 changes between 11099 and 11102, just that most of them are not visible. This is OS development. Looking at this one visible feature and a ton of known issues, some of the testers felt a little cheated. However, Microsoft had promised to accelerate the number of preview builds starting from January this year at the cost of more bugs getting undetected by the internal team. Gabe Aul had also clearly mentioned that the increased frequency of builds means more bugs and fewer new features. He had further advised Insider program members to switch to the Slow ring to avoid tackling with more bugs than the features.